And the news just keeps on coming. This time it’s another switch of chassis (marque) for the ALMS, with the news that Michael Petersen and Dale White at Petersen Motorsports / White Lightning Racing have decided to switch from Porsche to Ferrari for 2007. The program will see the highest level of factory support the Nevada-based organization has enjoyed in its sports car racing career – but the team’s release points out that ‘the partnership with Ferrari Corse Clienti stops short of a full-factory effort, allowing the No. 31 to pursue a third consecutive IMSA Cup championship for privateer entrants’. The Ferrari F430 GT’s race debut will be at the 12 Hours of Sebring in March, the team expecting to take delivery of the new car in mid-February. No drivers have been announced at this point. 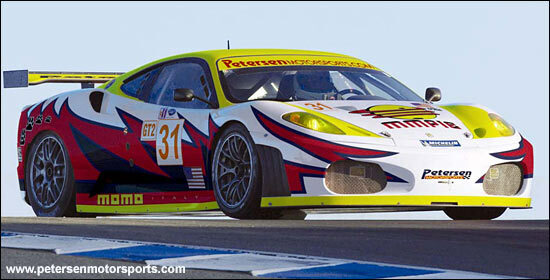 So after a long sequence of success with Porsche, it’s a Ferrari for the 2006 ALMS Champions next year. Risi Competizione will be running two of the Ferraris again, and part of the appeal of the GT2 class will be observing how Porsche’s new 997 performs against what was the fastest car in 2006, the Ferrari 430. The #31 car will be shaken down at Fiorano in February, then test over several days in March, at Sebring, before its race debut in the 12 Hours. The No.31 car will race on Michelin rubber.